A strong background in mathematics is an essential part of the academic development of each Ursuline High School student. Members of the Mathematics Department believe that superior standards of academic achievement and varied methods of instruction and assessment are necessary for the total development of the individual student. Students are initially placed in mathematics courses through a review of the students achievements in elementary mathematics courses, their performance on standardized tests, their group performance on the mathematics section of the EXPLORE Test used for admission to Ursuline High School and student/parent performance. All students are required to graduate with four credits in mathematics. Included in this course are: a review of the fundamental operations of addition, subtraction, multiplication and division of fractions, decimals and percents; an introduction to the basic concepts of whole numbers, integers and real numbers; the language and symbols of sets and functions, and an investigation of the basic properties of Algebra involved in solving equations and inequalities. This course is recommended for those students who score below the 25th percentile on the math section of the Ursuline placement test. This course deals with an in-depth study of the real number system that includes whole numbers, natural numbers, integers and rational numbers. Other topics include solving first and second degree equations and first-degree inequalities, graphing linear equations, addition, subtraction, multiplication and division of polynomials; factoring polynomials and applying all of these topics to practical word problems. 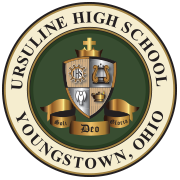 It is recommended that students score in the 25th percentile or better on the math section of the Ursuline placement test. This course is designed for juniors and seniors who are planning to go on to college and would like to have a comprehensive review and refinement of the mathematical skills necessary for college level math. The course will reinforce the algebraic concepts of solving equations, factoring, linear equations, and polynomials; deal with geometric relationships for solving real-world problems; introduce trigonometric and circular functions; apply mathematical principles to solving word problems; and utilize calculators and computer software in the application of mathematics to real world problems. PREREQUISITE: PASSING GRADES IN ALGEBRA I AND GEOMETRY. This course is NOT open to students with a “C” or better in Algebra II.